Interestingly enough there are people who are required to act out another life; we call them actors and actress. It is possible to meet these actors not only through the screen, but on the stage as well. Budding stage actors and actress can be seen on campus preparing for various play acts while participating in drama clubs. Recently one of these drama clubs “MUPPY” had put their annual play to stage so we decided to meet up with “MUPPY” and ask them questions about their club activities. Q1. Would you briefly introduce “MUPPY” to us? 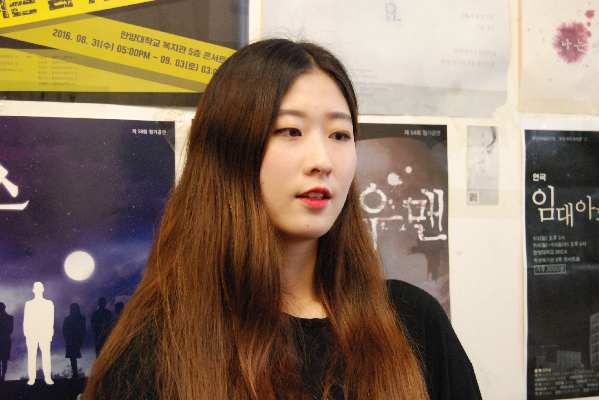 A. MUPPY is a Hanyang University (HYU) drama association. It was created in the 1980’s along with the establishment of Hanyang Univeristy’s ERICA campus. We currently have 78 members that work hard to put on annual plays for the students and faculty members of HYU. Q2. What does MUPPY mean? A. It’s an acronym for the Korean saying; the show must go on. For the members of our club, the name means that we must keep our enthusiasm even if we are away from the stage. We do that by remembering the passion that felt when we were on the stage. To open a play, members go through various hardships which is why “passion” is the most important driving force we need when we prepare a play. Q3. Is there any qualification for entering the club? When can you apply to participate for this club? A. We always are recruiting so I highly encourage anyone to contact us whenever they feel like participating. There are no qualifications for joining. Anyone who is interested in plays can join. Q4. What activities do member usually members do in the club? A. The association holds regular workshops during the vacations and performances in March and September every year. In addition, we hold a theater seminar where members are invited to study about theater. We do vocal practice, monologue reading together as well and watch other drama plays whenever we have the time to get together. Q5. How are works selected for the regular performances? A. The directing team chooses the scenario. From my knowledge, they read as many scenarios as they can and through careful discussion, choose the best play to be put on stage. Q6. Do you have any last words? A. We need many people to produce a play, not just actors. If you are interested in plays and have passion, don’t hesitate to join us. It is not easy to complete brilliant and breathtaking plays. However, the even in this moment, member of MURPHY are working passionately to produce another high quality play for HYU students. Let us look forward to the endless march of the quality plays that 'MUPPY' that produces.